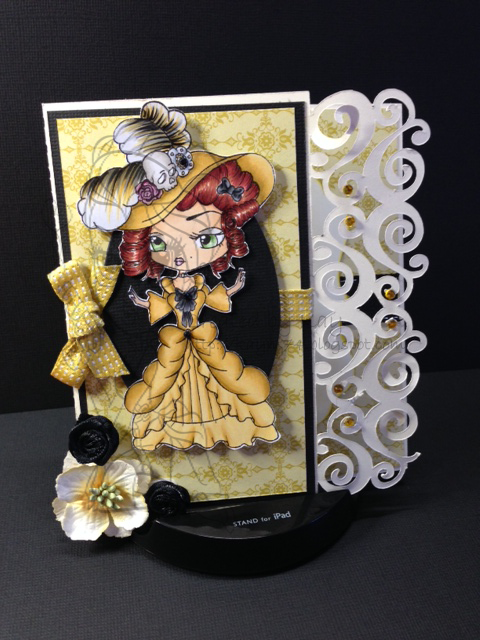 Welcome back to Cards by Kay it is time for a new challenge of " Anything Goes " at The Stamping Chef . This week I am showing the very gorgeous Bella Boudoir check her out at the store. She is just so sweet ! I have used a card from my silhouette studio for this card the base card is cut from Very Vanilla from Stampin Up ! along with designer series paper in Summer Starfruit along with matching ribbon the black card is from Core'dinations. The oval die is the petite ovals from Spellbinders. Don't forget the other fantastic DT girls they have some wonderful project to show you ! Links to which can be found in the sidebar.